It’s no secret that farmers across the country continue to struggle. 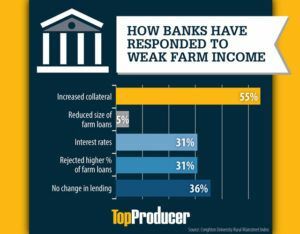 In fact, 31% of bankers who participate in Creighton University’s August Rural Mainstreet Index reported rejecting a higher percentage of farm loans than they did in July. Jim Moriarty a dairy specialist with Compeer Financial, says operating loan and credit line renewals are likely to be more difficult than they usually are. If you’re planning on seeking financing in the coming year, there are four things top operators can do to make securing that loan easier and faster. Write an annual report of your operation. A good overview not only describes your operation’s performance during the past year but also highlights the opportunities and challenges you face, Peter Martin of KCOE ISOM says. He advises producers include important information like the past year’s crops, yields, acreage or equipment purchases or sales, employee turnover, successes and failures. “It’s even a good idea to provide an update on your family,” he says. You must provide your banker with quality and timely financial info. The financial statement is a key form of communication between the lender and the borrower. According to Martin, producers should be sure their balance sheet reflects their assets and liabilities at true market value; don’t under- or overestimate. Martin advises producers to give themselves plenty of time to gather the appropriate financial information. “It’s your job to present a plan to your banker,” says Curt Covington executive vice president of agriculture finance for Farmer Mac. “It’s not your banker’s job to come up with a plan.” Provide income projections and assumptions. Martin advises stress testing those projections as well. “Determine how much you need for your operating loan and then be able to justify it,” Covington says. Be prepared to ask your banker for the financing you need. Bankers don’t want to hear ‘I’ll take the same amount I took last year,’ he says. Also, be prepared to discuss any equipment financing needs.